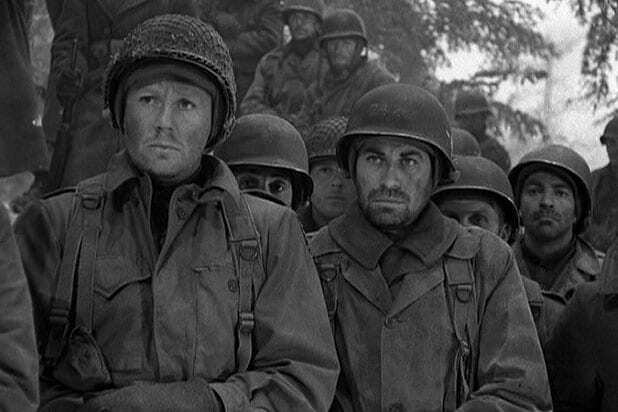 "Battleground" (1949) A squad deals with being trapped in the besieged city of Bastogne. 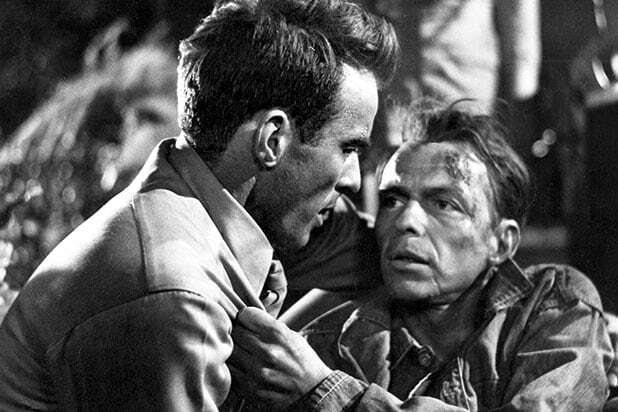 "From Here to Eternity" (1953) The film is set in 1941 Hawaii and is about a private who is punished for not boxing on his unit's team. It stars Burt Lancaster, Montgomery Clift and Deborah Kerr. "Stalag 17" (1953) Starring William Holden and Don Taylor, a German POW camp barracks marketeer is suspected of being an informer when two American war prisoners are killed. "The Caine Mutiny" (1954) Starring Humphrey Bogart, Jose Ferrer and Van Johnson, it follows a U.S. Naval captain who shows signs of mental instability that jeopardizes the ship. "Bridge on the River Kwai" (1957) A British colonel cooperates to oversee a construction of a railway bridge for their captors after settling differences with a Japanese POW camp. It stars William Holden, Alec Guinness and Jack Hawkins. "The Guns of Navarone" (1961) A British team is sent to occupied Greek territory to destroy a massive German gun emplacement. It stars Gregory Peck, David Niven and Anthony Quinn. "The Longest Day" (1962) John Wayne and Robert Ryan star in the film following the events of D-Day. "The Great Escape" (1963) Starring Steve McQueen and James Garner, Allied POWs plan for an escape from a German camp. "The Dirty Dozen" (1967) Starring Lee Marvin and Ernest Borgnine, a U.S. Army Major is assigned to lead convicted murderers to assassinate German officers in World War II. "Where Eagles Dare" (1968) Starring Clint Eastwood and Richard Burton, allied agents stage a raid to free an American General. "Battle of Britain" (1969) Michael Caine, Trevor Howard and Harry Andrews star in the film about the British Royal Air Force against the Nazi Germany Air Force. "Patton" (1970) The Francis J. Schaffner-directed film chronicles the careers of American general, George S. Patton. "Kelly's Heroes" (1970) U.S. soldiers sneak across enemy lines to get their hands on Nazi treasure. The film stars Clint Eastwood, Don Rickles and Telly Savalas. "Tora! Tora! Tora!" (1970) The film dramatizes the Japanese attack on Pearl Harbor. "A Bridge Too Far" (1977) Starring Sean Connery, Michael Caine and Laurence Olivier, "A Bridge Too Far" chronicles the events of Operation Market Garden in 1944. "The Big Red One" (1980) Starring Lee Marvin, Mark Hamill and Robert Carradine, the film chronicles the story of a sergeant and his unit as they try to survive World War II. "Das Boot" (1981) Starring Jurgen Prochnow, Herbert Groenemeyer and Klaus Wennemann, the film chronicles the world of a WWII German U-boat. "Empire of the Sun" (1987) Another Steven Spielberg-directed film stars Christian Bale and John Malkovich in the film about a young English boy who struggles to survive under Japanese occupation. "A Midnight Clear" (1992) The film starring Peter Berg, Kevin Dillon and Arye Gross tells the story of the American intelligence unit which finds a German platoon wishing to surrender. "Saving Private Ryan" (1998) Starring Tom Hanks, Matt Damon, Tom Sizemore and Edward Burns, the film follows a group of U.S. soldiers that go behind enemy lines to retrieve a paratrooper. "The Thin Red Line" (1998) Terrence Malick's adaptation of James Jones' 1962 novel stars Jim Caviezel, Sean Penn and Nick Nolte, and focuses on the conflict at Guadalcanal. "Enemy at the Gates" (2001) Starring Jude Law, Joseph Fiennes, Ed Harris and Rachel Weisz, it's about a Russian and German sniper who play a game of cat-and-mouse. "To End All Wars" (2001) Four Allied POWs endure hard treatment while they are captured by the Japanese during World War II. It stars Robert Carlyle and Kiefer Sutherland. "Pearl Harbor" (2001) The Michael Bay-directed film starred Ben Affleck, Josh Hartnett and Kate Beckinsale and follows the story of two best friends as they go off to war. "Downfall" (2004) In the German biographical film, the final secretary of Adolf Hitler tells the story of the Fuehrer's final days. "Flags of Our Fathers" (2006) Clint Eastwood directed this film also, starring Ryan Philippe, Barry Pepper and Joseph Cross. It follows the life stories of six men who raised the flat at the Battle of Iwo Jima. "Letters from Iwo Jima" (2006) Clint Eastwood directed the film about the battle of Iwo Jima between the U.S. and Imperial Japan. "Valkyrie" (2008) Tom Cruise, Bill Nighy and Carice van Houten star in the film that dramatizes the July 20 assassination plot against Adolf Hitler. 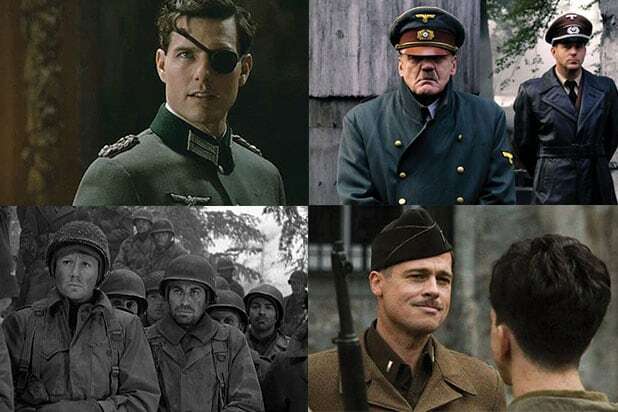 "Inglorious Basterds" (2009) A group of Jewish U.S. soldiers plan to assassinate Nazi leaders in France. The Quentin Tarantino directed film stars Brad Pitt, Diane Kruger and Eli Roth. "Fury" (2014) Brad Pitt, Shia LaBeouf and Logan Lerman star in the David Ayer-directed film. "Dunkirk" (2017) Christopher Nolan recounts the heroic efforts to evacuate Allied forces surrounded by Nazis on the beaches of France at a critical moment in World War II.